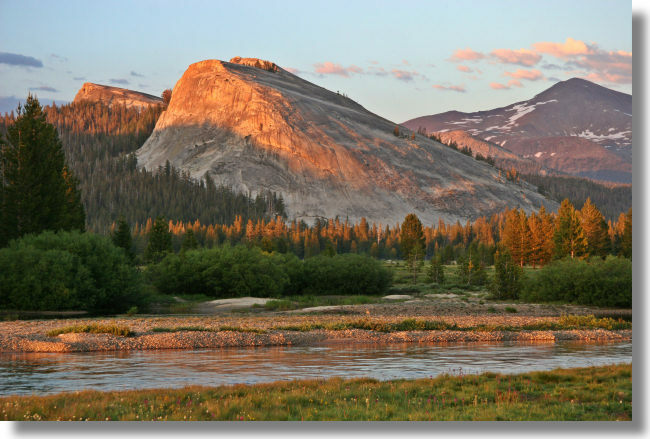 If you've got a stressed-out friend whose doctor recommends that he learn to visualize and meditate on an idyllic meadow, send him over to Tuolumne Meadows to take the cure. Tuolumne has all the requisite elements: acres of grass and wildflowers, a river that winds lazily through it in an apparent attempt to avoid leaving, a picturesque foot bridge, amusing critters (marmots, in this case) romping around in the daytime, and deer emerging from the woods in the evenings to browse. It's also got a soda springs (though you probably won't find this too impressive), rows of granite peaks surrounding it, and several trails, mostly leading to lakes, radiating out from it.